You should eat a well-balanced diet and drink plenty of fluids as this will provide the nutrients for building new tissue. Please ask your nurse or doctor for more information about nutrition. Primary wounds: surgery has been performed to the skin. Secondary: Trauma has occurred to the skin, such as with a leg ulcer or a pressure ulcer. 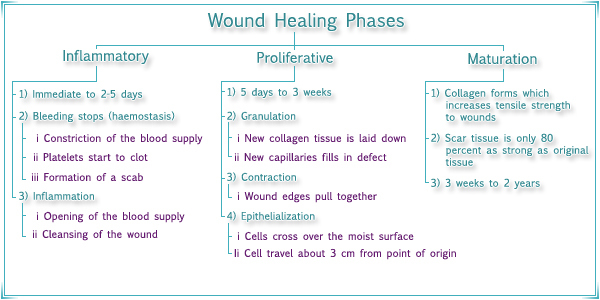 The wound healing process is primarily split into three phases: inflammatory, proliferative and maturation. The diagram below outlines these phases. The best environment for the natural wound healing process is a warm, moist and non-toxic one. Drying out the wound will cause the healing process to stop. However, too much wound fluid will result in skin becoming very wet and resulting in further tissue damage around the wound which needs to be taken into account when selecting a dressing. A sudden increase in exudate (liquid from the wound) may be an early indication that an infection is imminent. The ideal wound temperature has been identified as body temperature (37 degrees Celsius). A reduced temperature may stop the activity of cells involved with the healing, therefore modern dressings are designed to maintain this optimum temperature. You should eat a well-balanced diet and drink plenty of fluids. As this will provide the food for building new tissue. If you are unsure about a well-balanced diet please ask your practitioner for more information about nutrition. Please ask you nurse or doctor for more information about nutrition. A separate leaflet is available about nutrition. How can I help my wound heal?